Wherever we see a rainbow we are reminded of God’s promise in Genesis 9:13-16 to each one of us not to flood the earth again. God said the promise is between him and you personally. This is incredible because each of us see our very own rainbow. When we see a rainbow, the light is reflected at a very specific angle. 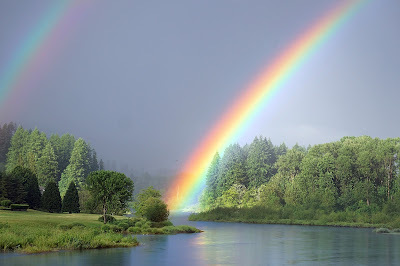 So even when two people are looking at a rainbow in the same direction, they see light reflected off of different water droplets. The rainbows they see may be close to each other, but are not the same. So no two people look at the same rainbow.3 God made a promise to you and he makes a rainbow just for you to look at. The rainbow is a constant reminder that God keeps all his promises. Do you believe God keeps his promises? How do you feel now that you know God makes a rainbow only you can see? What other promises has God made in his word for us?